What People are Saying About Ask Leo! - Ask Leo! What People are Saying About Ask Leo! 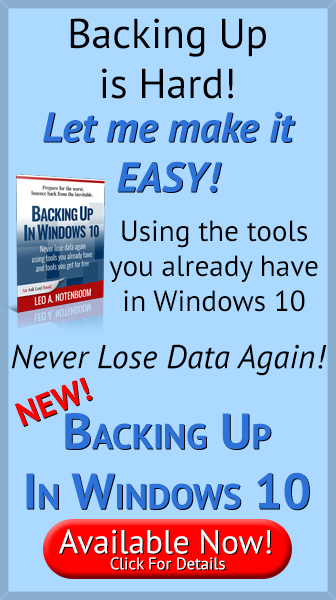 Hello Leo: I wanted first to thank you for your very helpful book on Macrium Reflect. It was like having you stand behind me while I ran the program for the first time. This isn’t a question, it’s a thank-you. So thanks, Leo, for pushing your readers to backup, backup, backup. And thanks for recommending Macrium, it did exactly what it was supposed to. I just scanned through my copy of Backing Up 101, I still feel the same way about the book as I did when I read it for the first time. efficient job than the way I was doing it. You did a great job of making the most important point ………….. Backing Up can and should be done by everyone. Thanks for all you do to keep us excited and engaged ….. your news letters and books have put the fun back in trying new things. Hi Leo, I have been reading your columns for many years and I thank you for your efforts. Thanks for the great job you do for us (less than geeks). – Carl and Judy. I am gonna set a goal to become an expert using Macrium Reflect software and when I write my recommend to the public, I hope leo sells one thousand (1,000) books. Just a quickie to say a big Thank you Leo for all your help, especially the Windows 8 problems. You give this 75 year old grandmother on the other side of the pond encouragement! – Frances. Thank you so much for all your work, and your obvious dedication to quality. Your Ask Leo articles are very explanatory and to the point. I look forward to each one. Just want to say I REALLY appreciate that your videos don’t start automatically like they do on so many sites. I can only access the internet through a mobile carrier where I am and therefor do not get unlimited data (at a set price). I get limited amount of data at a set price then have to pay unreasonable (?) rates if I go over. So once again Serious KUDOS for doing it right. I’m 54 Leo and have been reading your site (and newsletter) for years. Thanks to you my friends think I’m a computer expert/guru. Hardly that, but I’m glad to learn from you and help others. And, yes, I DO tell them where I learn my stuff!! This is not a question-rather, a compliment. Thank you for such a great web service to truly learn and keep up with today’s technology! YOU- can’t make explaining and answering any clearer. It’s sometimes hard to put on a smile these days–but when I see my Ask Leo email in my inbox, I indeed–do smile! You remind me of an old computer half hour tv show in the late 90’s called the ” The Disk Doctors”. Two guys who would answer call in CP questions and gave the answer so clearly. No question here, just wanted to thank you for your articles about backing up. Thanks to you, I have the first real backup in years. I am using Macrium reflect (free) and its working well. After creating an initial image, the daily backups take from 5-20 minutes and run without bogging down the system. When they start taking longer than that, I run out of space anyway and create a new image. I just manually manage the images and backups, its not a big chore. In fact, I sometimes find myself backing up more than once a day. I can always go back and delete the day’s earlier backup. The thing I am lacking is off site backups. I guess I need to buy some more removable hard drives. I have also used Reflect to image computers before upgrading them to a bigger hard drive or to an SSD. The restore has worked, the system boots, and then I can adjust the partition sizes as need with disk manager. I would consider buying Reflect to get incremental backups, but the $70 price tag is a little steep for me.